in a story that is worth transmitting through our mouths and ears. However, what they strive for is not collective memory whatsoever. This is only a one way narrative by the government and the media. 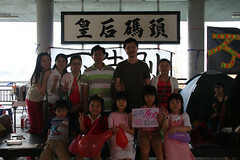 a space that allows the voice of the people from the bottom up. It is now a place where any citizen are free to hold any activities. In the future it will belong to big shopping mall run by a hegemonic government and capitalist. That's why for the people, not only for oneself, the fight has to go on. They, all love this Hong Kong. Chong Head's photostream: "The Queen's Pier is an important public space and historical building in Hong Kong. It is a part of the architectural complex built in the 1950s and 1960s when this city came into its modern age despite under the colonial rule. It was place for the arrival of the English royalties and colonial governors. Since the late 1960s, it has become a gathering place for ordinary people. Now the Hong Kong government is going to demolish it for making more rooms for real-estate developers and the commercial sector. A group of people have fought for over eight months to preserve it and attempt to stop the government's bulldozers. It has become the most famous historical preservation movement in Hong Kong history. 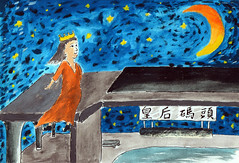 This illustration is depicting a queen-like girl sitting on the roof the pier." I am kind of aware that Star Ferry has ceased operating for quite a while. But little did I know that the entire Star Ferry Pier in Central has been demolished to make way for reclamation. I am shock and feel a great sense of loss. The Star Ferry, the Pier and its surroundings (Maxim fast food store, the SCMP bookstore, the taxi and minibus stands, etc.) were all a part of my life. Equally shock is that very soon, Queen's Pier, a place I also used to walk by quite often, will be gone as well and will only exist in people's memory. All these brings back the memory of another complete destruction of a neighborhood that I once lived in. Although that destruction brought a much nicer looking neighborhood, I hate to see the complete disappearance of a familiar place, and the people and their way of life that made that place so special and so dear to heart. 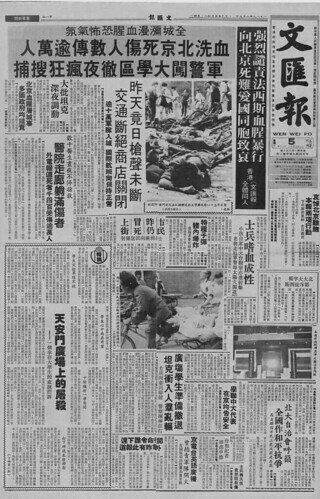 Via competitionforce.hk, a commentary titled "This city will never be the same again" by Steve Vines, originally appeared in The Standard. Vines reviewed the Hong Kong Chief Executive Election which will be held today (Sunday) in Hong Kong and points out the uncertain options ahead for Hong Kong's road to democracy. "In other parts of the world, a special place in hell is reserved for journalists who confidently predict election outcomes just days before they are announced. Lamentably, this does not apply in Hong Kong, where the result of Sunday's chief executive election has been preordained. Yet Sunday's result is only one part of the story, because it seems increasingly likely that a variety of other results are not so predictable. Donald Tsang Yam-kuen will be elected to a second term in office, but will he claim that he has secured a popular mandate? Or will he, more modestly, assume that he has the mandate of only the few hundred who were allowed to vote? Surely the temptation will be to claim a wider mandate - one justified by high ratings in public opinion polls. Such a claim, however, carries dangers because it would lead to the question of why the new chief executive was claiming a popular mandate while refusing to put it to the test - in a real election by universal suffrage. Meanwhile Mr Tsang's opponent, Alan Leong Kah-kit, can also make some sweeping claims about success in this election. He can say that he succeeded in creating a competitive poll, that he made an impressive showing in the televised debates and forced the incumbent onto the defensive in explaining his policies. Yet Mr Leong's participation in the campaign has widened, or at least publicised, divisions in the democratic camp. A minority of pro-democrats believe he has betrayed the campaign for universal suffrage by taking part in a small-circle election."